Perfect for under my kitchen table! 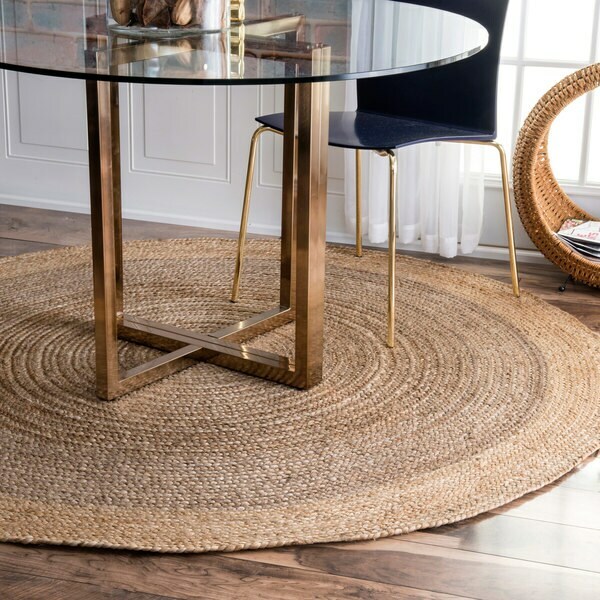 Deliver an effortless accent into your home with this reversible jute rug. Made of hand-spun, braided jute fiber, this rug is naturally silky and highly durable. Jute fibers are also a fully renewable resource, making this rug an eco-friendly choice. Very pleased with this rug after about 1 month in my home. It makes the entryway look modern, bright, and airy. Its quite soft. Of course, jute can never be as soft as a carpet type material but I have no issue walking on this with bare feet and the dog spends just as much time laying on it as the previous carpet type rug that was in the space. It is shedding, but I don't notice it on my floors, only on the bottom of my socks and stuck to the dogs fur. The color is great too, a mix of white, creme, grey, and browns much like a berber carpet. I think the variation will help the rug appear unstained for a long time. The dog already vomited on the white portion and the stain came out completely with the use of *** carpet cleaner and rinsing with water with a towel under the rug. I used the Mohawk Home Premium Felted Non-Slip Dual Surface Rug Pad underneath and its a perfect amount of plushness combined with the rubber backing against the floor to keep the rug firmly in place. The color in the lighter photo is more accurate. We loved the look & quality of this rug online! It is a soft texture, will lay flat although an edge or two curls up just a little from day to day. Just pushing it down keeps it down for a day or two and a double sided tape would work wonderfully but I don't find it necessary. There is no odd smell, is packaged wonderfully and is overall a fantastic, stylish rug choice. Because of the texture my cats like to scratch it and while they did cause the fibers to be pulled out and fray they were able to be cut then and it returned back to new so I find it durable. 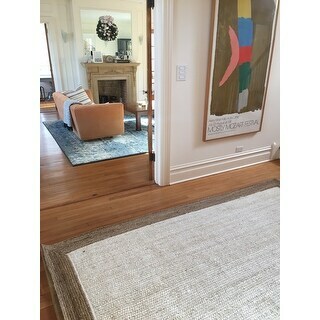 I do believe the rug is beautiful but it does not look as varied in color as it does on the online picture. Mine has a lighter outer banding then it goes to gray and it's consistently gray all the way to the center. The picture online shows it to have varied color patterns all the way to the center of the rug which was the part I really liked online. I've included pictures to show you the way mine actually appears versus the online picture. It's still very pretty and I love that it blends amazingly with the floor and works perfectly under my large square table to even accommodate the chairs as they're pulled out. It just couldn't work any better for a table. I like the coloring online better but it's still gorgeous and we are very very happy with the purchase. It is a classy rug yet relaxed adding texture and style but certainly blends well and isn't overbearing. Excellent choice! 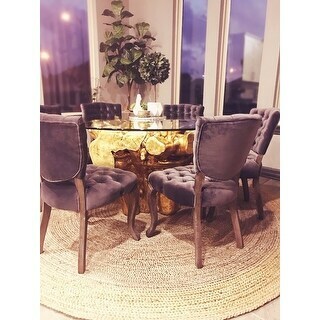 I purchased this rug for my dining room. It looks wonderful. 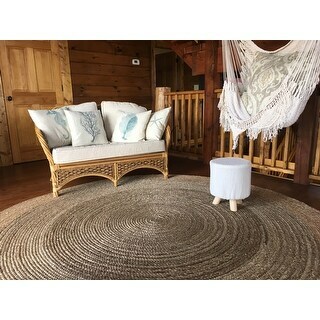 Soft jute rug! Great color and size! It arrived in a timely manner, and is exactly what I would expect. Not that this was a problem, but the rug did not have the contrast pictured between the edge and the center. There's a contrast, it was just not very pronounced in the rug I got. However, it's pretty, seems good quality, and was a good price--so I can't complain. I know it's hard to exactly represent the colors in a photograph. I am very pleased with the quality of this rug and the color. Just a beautifully made run. I highly recommend it. After an extensive search of jute rugs, I was very pleased to find this one with the right shade of yellow. 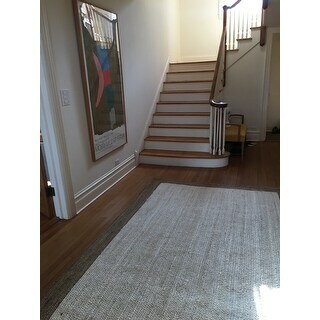 It is a warm, slightly mustard yellow that plays well with the natural jute border. Overall, I feel the rug was well priced. However, because of its material, the rug is not a perfect rectangle. It curves along one of the long edges and bows slightly on the other side as well. In addition, this rug is in a low traffic area and I already see some of the braids coming loose on the edges. I will have to cut them to avoid further pulling. Some people complain about the loose fibers/hairs these rugs tend to create. Although I have seen some loose threads, overall I don't find it to be an issue. I will say its not as perfect in quality as it appears in the picture, but I'm still pleased with it. I am extremely pleased with this purchase. The rug is exactly as pictured, a pretty cream color with a tan border. I read a review mentioning shedding, but I have it on my hardwood floor and have not any issues at all with shedding. It is soft (for a jute rug) and appears quite sturdy. I would definitely recommend this rug! First of all, I have no idea the quality of this rug, it looked lovely online. I didn't even open it. Gave it one star bc of the false (completely false) delivery estimate. I was out of town for the sole purpose of decorating my son's apartment and had a 2 week window to do so. Bought this rug (gave it a few more days to deliver as well) bc it was supposed to arrive within the time frame right for me. Whatever date it says will be delivered, add 1 or 2 more weeks. If this was a purchase for my home, I would have been annoyed but would not have been a deal breaker. I ordered 2 diff sizes the same day. The rug that arrived on the day before I was to leave town was supposed to be the larger rug, it was the smaller one, mismarked, so another negative. Because I could t get both rugs delivered prior to my leaving so I could set them up, I returned sight unseen. I love aoverstock and have never had an issue, but this vendor evidently has no clue how to estimate shipping and delivery. I've only had this rug for a week or so and its already fraying all over. Poor quality! We had been searching for an accent rug to go with new hardwood floors and our coastal décor, and came across this one. As soon as we put it down on the floor, it looked like it had always been there. Everything about it fit perfectly to the room...so much so that we just bought two more in other colors for other rooms of our home. The rug is beautiful and can match almost any decor. I have it in my entry way and is made very well. It is holding up to very high traffic so far. The colors are very neutral and the weave is tight wnoghbthe vacuum isn’t pulling the rug. I am extremely disappointed in this carpet. Very poor quality (threads come loose, NOT reversible). Absolutely NOT what I expected nor is it anywhere near the price paid. There is a reason Overstocks sells a warranty with this carpet (trust me... YOU WILL NEED IT). This rug will not last a year of traffic. While it may look good in the pictures... trust me, once it's in your home you will notice quickly - the poor quality of workmanship (again, loose threads that will open up to larger holes after walking on it in only a few days). UNREAL. BUY AT YOUR OWN RISK. Awesome rug. I was looking for a 'new' look and this is the perfect touch. It flattened quickly. Colors are rich. Perfect rug for under my dining table! Rolled out nicely and flattened out quickly. It's tightly woven and nicely made. It's a great neutral color. This rug adds a nice touch to the landing where I placed it. 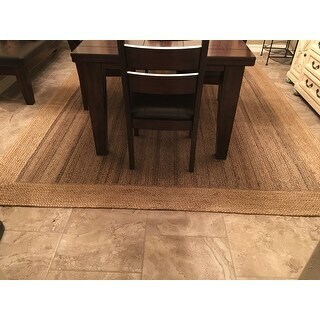 I've purchased several other jute rugs--in the past and recently--and this one is not my favorite, but still nice. It's quite flat and a little dingy looking because of the gray color. I gave it 4 stars anyway, because it was less expensive than the similar ones I looked at and very much true to the photo. A good rug for the money, but if you spend a little more, there are nicer options. Looks great and feels softer than you would think. Over time you do get some fray ends but just trim back. This rug has a nice texture and looks great on my antique oak floor. I typically give 5 stars if I would purchase the item again. This product arrived in perfect condition, seems to be very good quality and matches the description provided. 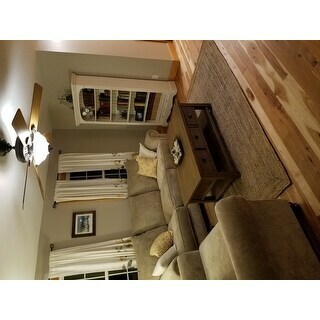 "Love the table (base) shown in picture -- is it available on overstock?" The table displayed in the images are not for sale. "I’m having a hard time distinguishing between the brown and the grey. They look the same to me. I have a rug in my family room that is grey/tan and ivory. 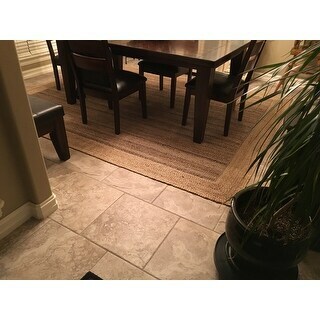 I’m trying to get a runner and front entry rug to match but both the brown and the grey listings look the same. What are the differences?" The Gray Barn Cinch Buckle Braided Reversible Border Jute Area Rug - Colors Grey is has a lighter tone than the Brown. Both options would be a great addition to your home! "How does this material feel on bare feet? Is it soft?" This rug has a semi hard feel on bare feet. "This rug is beautiful, and *exactly* what I wanted. Unfortunately, my dog decided to pee on it. I am really upset, because I don’t this this rug is cleanable. Any advice ? " Visible and loose dirt should be regularly picked up with a broom or vacuum cleaner. Liquid spills can dissolve dirt particles and bring them to the surface causing watermarks to form. Therefore spills must be dabbed immediately with an absorbent white cloth and then dried. "Is this a WHITE white.... or more muted with the gray mixed in? Don't want BRIGHT white." The central light color is more white than grey. "Is this a true WHITE color... or more of an ivory/off white? Thanks!" This is more of a off-white color. 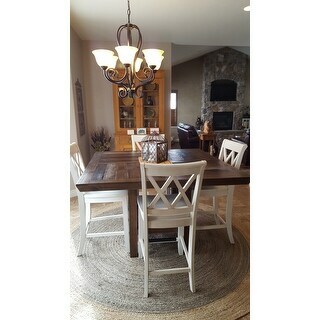 "Just received my gray barn cinch buckle braided reversible border grey Jute area rug. The rug is made by NuLoom? And, the NuLoom Tag is sewn in on one side, making it hard to be a "reversible" rug. Did I receive the correct rug?"